Goof up alert!! !...I don't know what happened but this post went out all on it's own last night! I wrote part of it before dinner, woke up this morning to a comment and realized it must have posted. So sorry. For those who have read it, just scroll down to the photo of Diane and Helen and continue. For those who have not, I hope you enjoy the whole post! I'd call this post refrigerator round up if I was in the kitchen. There are so many things I'm piling into this post it's like the fried rice Joe is making us for dinner...some of everything we've eaten in the last few days! I'll start with a lovely quilting retreat I went to on the coast of Oregon. I'm lucky to be included in this incredible group of women. A long time friend, Victoria, invited me to join them a few years back and I never say no to Victoria. Loved the whole trip. First to Eugene, on her horse ranch/farm (I'm a city girl, I don't know what to call it!). I traveled with another lovely lady, Gracie, and the three of us moved on to Seal Rock to join the others for a few days of sewing. I'm not a quilter but my god daughter is having her first baby and I wanted to make her a baby blanket. Well, I didn't know what I was doing so thank goodness for Victoria and another friend, Kathy, who gave me so much help. Basically, I made mistakes and they fixed them! (See below). I know that my god daughter likes neutral tones, no pinks and blues for her. I chose grey and I'm glad I didn't, when she opened the present she exclaimed, "My whole house is grey and so is the baby's room!" Whew. Here is the baby blanket put together but not finished...oops, it turned out a bit large...but they can use it for watching tv! I actually like modern quilts. I might just make others...someday. Thank you to everyone at the retreat who helped me make this. Lord knows I needed it. Oh, and while I was up there I bought a new Baby Lock Triumph serger! I have an Evolve that I've loved and wanted one with a large space for piecing cashmere. I bought it from Paramount Sewing and Vacuum. Very nice people. Love this thing. I've been using it all weekend and it's a dream. 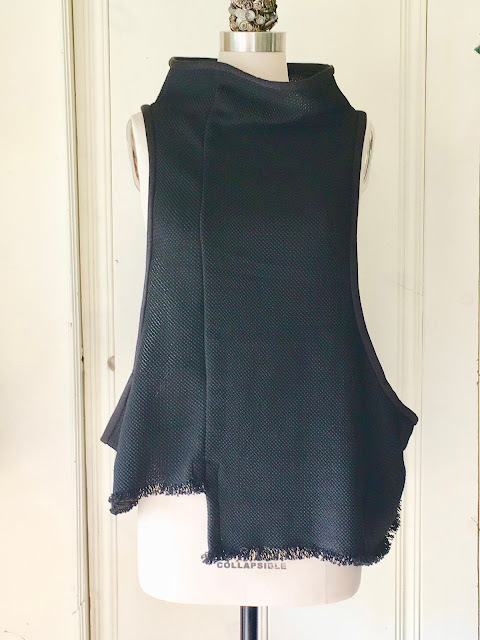 This vest is made from a ready to wear piece that a friend bought. Jenny made a pattern and I gave it a try with fabric Sharon gave me. It's a heavy stretch woven novelty that I couldn't figure out how to use. This seems to be a good result. I wore it in Ashland recently and it feels good. I'll make more of these for sure. The pockets are tucked into the side seam. Hidden but useful. Kinda like a sidesaddle kangaroo! During January I went through an insane period of working with down-filled objects. First I worked with two men's extra large puffer jackets I bought in Ashland. They were on sale for a pittance and I couldn't resist. I've been asking Marcy Tilton to find puffer jacket fabric for years now and I know why there is none available. It's completely bonkers to work with. I had to take the jackets apart, place my pattern pieces on the fabric, trace around each piece, sew on either side of my tracing, cut in the middle of the stitching and STILL had feathers in my nose. I ended up using all four of the pockets from both jackets so there's no shortage of pockets here. I used the stretch binding I ripped out of the original jackets to bind the hem. Oh, I forgot to say, all of the seams were BOUNDS so I had to tear out the binding first. I did use it all to bind the new seams. And then, as if that wasn't aversion therapy enough, I decided to cut our duvet in half and make two comforters so Joe doesn't tear the covers off me every night (it's worked, by the way). I'm sleeping better and so is he! I just got home from DOL in Ashland. I enjoyed myself thoroughly. Diane Ericson was spot on, as usual. So inspiring and invigorating. She invited Helen Carter from Secret Lentil to co-teach. What a hoot she is. 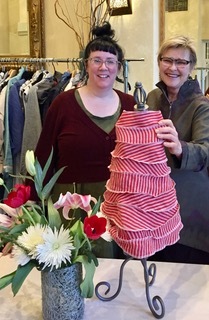 Her approach to designing clothing is totally intuitive and very fun. I've loved her clothing for years, own two pieces, and wanted to see how she works. 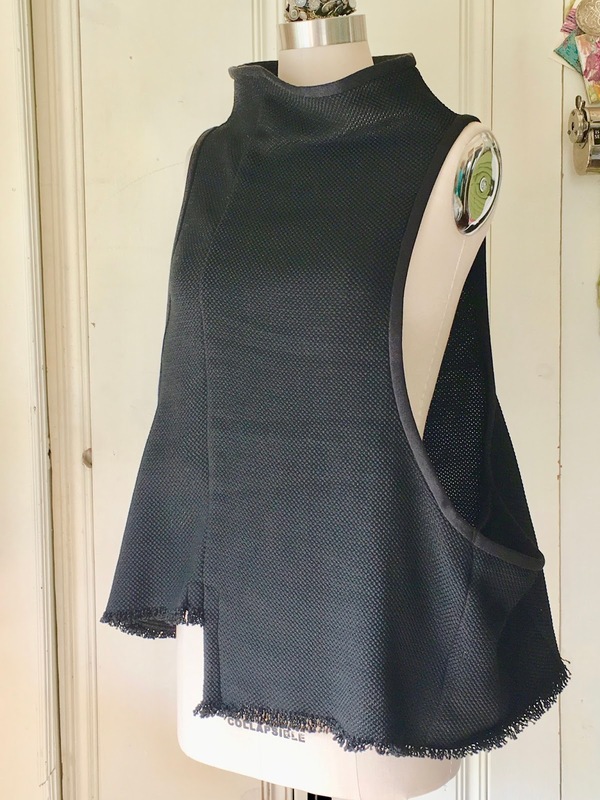 I needed to draft a tunic top for woven fabric so I used an existing vest pattern. Forgot my pattern weights so the tangerines that Honna brought worked perfectly. I began auditioning the fabrics I brought. I was really inspired by Tracy's version of Helen's spiral concept. A big part of DOL is the incredible women you meet. And here is my version. I made a little Diane Ericson French-Fold Shrug to go over the top. It's a very cool pattern! And another version in a tissue weight knit that Judy, another participant, graciously gave me at the retreat. I made another spiral shape for the turtleneck. And finally, I finished a ripstop lined in polartec raincoat I've been working on since the last DOL! This fabric was a nightmare to work with. I'm finished but I don't love the detailing results. I'll never work on this type of fabric again. I guess my winter of 2018 was all about what NOT to sew with! Stay tuned for another whacky project I started yesterday. It entailed a LOT of ripping out as yo can see below.